Who Is Joe Doakes? Is he just a pseudonym for…Mitch Berg? – I get this a lot. I have to chuckle a good-natured chuckle when I do; I’ve written something like 20,000 posts on this blog over the years; I do not need a medium for additional writing on this blog. That’d be like Rush Limbaugh coming up with some character voice to do another talk show. Joe Doakes is in fact a pseudym for a local lawyer. He writes under a pen name because – he’s a local lawyer. You used to read and report on what a lot of Democrat-leaning blogs were writing about. You don’t so much anymore. Why? I waste less time by just subscribing to the Alliance for a “Better” Minnesota email blasts. Some of your commenters have to be sock puppets: Nope. Never done it, never will. Oh, it’s been tempting – the idea of abandoning my stentorian detachment under the cover of a fictitious identity and just cutting loose. But no, ever done it. Isn’t it high time you updated the DFL Dictionary? : Oh, yeah Great idea. Stay tuned. More to come shortly. 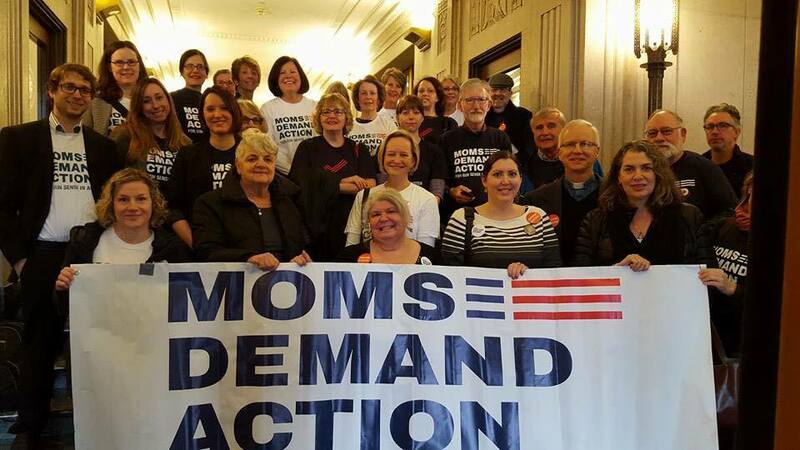 In your various pieces about “Protect Minnesota”, “Everytown” and “Moms Want Action”, you’ve referred to something called “ELCA Hair” to describe members of the groups. What do you mean? That’s a good question; it’s probably pretty opaque to people who aren’t familiar with liberal culture in Minnesota. “ELCA Hair” is, loosely, a hairdo prominent among upper-middle-class white members of the “Evangelical Lutheran Church of America”, a liberal Lutheran synod centered in Minnesota. What is it? Well, it’s easier to show than to tell. Every person visible in this photo exhibits a flavor of “ELCA Hair” (except the woman at the microphone; Minnesota liberalism grants Jewish liberals an exemption from ELCA Hair). The ‘do is the most effective frame for a face that’s sagged into place from, and for, a lifetime of self-righteous scowling. The young man on the left wears the cut acceptable for men below the age of about 34, provided they work for a non-profit. At 35, they morph into the versions in the photo above. The three women adjacent to him exhibit the ‘do deemed acceptable to women below roughly age 33. The second woman from the left in the back row has just turned 35; she has hacked her shoulder-length hair off at the ears, apparently to keep her Whole Foods club card. For men, it’s parted, just long enough to look a wee bit raffish and “counterculture”, just short enough to not draw attention. And beards are apparently not grown until they are guaranteed to grow in gray (and kept neatly trimmed under all circumstances). 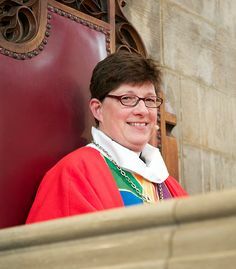 (Bishop Eaton is a little bit unusual; most women with ELCA Hair go gray once they reach about 38 years old. I suspect divine intervention). Anyway – that’s it for today! The ELCA hair…the close cropped grey beard on the men. The guy on the right actually is due for a trim. My people? I’m more comfortable around people who look like Duck Dynasty. What happened to Hot Gear Friday? You stopped liking guns and guitars? Did Men Without Women make The Current’s top album list? But I’ve been trying more of them lately. So yeah, I could maybe do a reprise of HGF. The closely cropped hair of the +35 year-old liberal woman is ubiquitous in Minneapolis. They can usually be seen around 4:00 on Hiawatha Avenue and are distinguished by A) slight graying (no touch-up – they’re au naturale), B) tortoise-shell or gray designer frames on their glasses, C) MPR stickers on the backs of their Volvos and an exceedingly patient demeanor as they wait for the lights to cycle around to allow for light rail. Origination: something government downtown. Destination: Southeast Minneapolis, where they share a bungalow with their Goth room mate and three cats. You need to add to the list of libidiot staff cars with the Toyota Prius. Don’t you realize that they are saving the planet for future generations? At least that’s what the over 65 crowd that drive them say about them. They qualify on the bumper stickers, too. Of course, they hate it when I tell them that according to several studies on them, taking into account the pollution generated from the massive open pit lithium mines and processing it and the electricity needed to recharge the batteries, those ugly pregnant roller skates pollute more than an IC engine. My elder brother, who is Mycroft to my Sherlock, used to write short stories that he published in small circulation alternative magazines. One story cycle was about a woman who lived in Powderhorn who kept getting mistaken for a lesbian. She would, for example, take a community center course in feminine self-actualization, not realizing that it was lessons in female masturbation. In another story she would take up bee-keeping, only to have her hives raided and her bees liberated by radical feminists who believed that bee keeping was exploiting the labor of the Queen. Most of the magazines that published his stories were radical left. I don’t believe that they realized that he was mocking them. TBS: Urk. My 35+yo wife has short salt and pepper brunette hair. However she does not look like a typical ELCAer. She would spend the money to get it colored slightly red, but instead of frivolities like that, we choose to send our kids to private Catholic school where they are (mostly) not indoctrinated and there is actual discipline. One kid got expelled from my daughter’s class last year (7th grade) and one kid this year (8th). Had the occurrences that got those two kids expelled happened in public school, they would have merely been quietly suggested to that their behavior, while natural outgrowths of adolescent curiosity and exploration, was causing discomfort to others. Both of these kids were from N. Mpls. You do the math. I can only hope that since the parents were willing to spend the money on that school instead of free public screwel, the kids got their asses reamed for getting expelled. BG: HAH!! Undetected mockery is the sweetest version. Bill, when she right around the age of 35, I came home to discover my wife had cut her waist long, blond hair just above her shoulders. So, now I’m married to a red head who swears never to cut her hair.